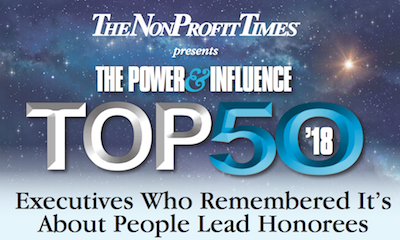 Themes emerge when putting together the annual NPT Power & Influence Top 50. There is an initial attempt to ensure leaders from all elements of the sector are considered. That often goes out the window when the list is down to the final 60 or so executives because it is clear that during the previous 12 months that certain leaders have stepped into the breach in spectacular fashion to deal with immediate issues. The selection process for this year’s honorees was no different than in recent years. This time national and international spotlights illuminated human rights issues instead of fundraising, technology or management. The challenges were not in a faraway land the spelling for which you needed a search engine. Texas is pretty easy to spell. Washington, D.C., and California are likewise easy to connote. It’s usual for nonprofit leaders to run to an airport. It is unusual for them to be headed in the same direction when it doesn’t involve a natural disaster. Those sector leaders have been attempting to mitigate disasters of the human variety, not Mother Nature -- the suffering on the border of separated families and heading to courts to successfully fend off abuses and to battle for basic human dignity for all. Several executives have been singled out for stunning performances in their sectors, unrelated to immigration, Deferred Action For Childhood Arrivals (DACA) or for simply being able to buy some baked goods. Data and partnerships were key elements to those selections. The 2018 honorees were selected from a group of roughly 300 top executives. A committee of NPT staff, contributors and a few executives plugged into executive movement were involved in the selection process. This is not a lifetime achievement award. The executive must have had an impact during the previous 12 months. There is quite a bit of turnover in this year’s roll call. There are 14 new honorees on the 2018 honor roll and nine executives who are returning to the list after a hiatus. The evening always involves conversation between people who would not normally have the opportunity to interact. The honorees always stick around after the event has concluded to continue the idea swapping and to run up the bar tab. Another great phenomenon about the event is the next morning. Many of the honorees can be found continuing the conversations in the hotel restaurant where those from out of town stay. Turn the page for the 2018 NPT Power & Influence Top 50. Join the NPT Membership Program today! Exclusive reporting, plus discounts on webinars, job postings, and our annual Nonprofit Organizations Salary and Benefits Report! California Wellness is leveraging influence (and dollars) to impact policy under Belk’s leadership. This has been true for some time, but she’s really ramped up in response to the new political/policy environment, setting a very positive example for foundation peers, and the sector as a whole. Biemesderfer brought national and regional grant-makers and philanthropy-serving organizations into an alliance. He has re-visioned grantmakers’ education and expanded the network to include impact groups with knowledge in specific areas of expertise, such as a particular funding issue, population group or practice. Sometimes magic happens when a well-heeled foundation is run by someone who grew up in that challenged community. Blackwell is making magic that is traveling its way across the nation. He doesn’t just know community development, he understands it. His secret is that it isn’t all about the money. It’s involvement, too. Bradach was talking about scaling impact long before it was a focal point of sector leadership. He has a world view and had Bridgespan working on projects in India, again, long before others were doing little more there than social service aid. He also has some unique views on unbundling and how smaller can be more impactful. Brown is the one guy who continues to stand between volunteers who work for the common good and the federal government sabotaging national service. His words: “You Fight for What You Think the Country Is About.” Leaders want to leave legacies. He has more than 25,000 legacies across the globe. Brown is a collaboration powerhouse. There’s the partnership with researchers and pharmaceutical firms for One Brave Idea to cure cardiovascular disease and the deal with the XPRIZE Foundation that pushes toward all health issues. She also launched the AHA Center for Accelerated Drug Discovery, part of a new strategic business relationship with the Lawrence Livermore National Laboratory. Bryant runs a nonprofit financial network that has directed billions of dollars in capital into urban and underserved communities. It’s not about just finding cash. He combines for-profit, government and nonprofit know-how into financial literacy, inclusion and economic empowerment training that can be replicated. Congratulations, Power & Influence award winners. We've been honored to recognize those who are making heroic efforts to change the world. Thanks to you and your worth missions, your prestigious acconmplishments have made a lasting impact in the community. Our team has great admiration for all that you do! Thank you for using your power and influence for the greater good of our communitities! Buchanan continues to ask the tough questions of foundation leaders, most recently showing a disconnect between what is possible and what is actually happening. Via his in-your-face style, he points out the shallow knowledge of funding areas and lack of collaboration that foundation leaders often refuse to acknowledge. It appears that the square peg finally fits the round hole. Bugg-Levine is an iconoclast in the best sense of the word. Throughout his career he has attacked cherished beliefs, both nonprofit and for-profit. He was in the room when the phrase “impact investing” was coined, proving it’s OK to profit while doing good. Canales is changing the way philanthropy and grant-making is done in Boston and it’s rippling across the nation. He grasps the elements that deepen the understanding of a community and supports risks taken in the quest for a resilient community in the face of rapid change. Change can sometimes curl the toes. Cardinali cares about the angst but just pushes through it. He’s reimagining IS and attempting to move the sector to a larger role of ensuring a just and civil society. IS was one thing when the sector was developing; he’s asking what’s next and helping to shape the discussion. A convener of the sector’s elite, her push for open source code and technology is ruffling feathers at firms making fortunes in the charitable space. She pushes impact investing in areas not in the usual tech bubbles. She looks for big ideas, understanding that some might fail, which many foundation leaders won’t tolerate. Politicians say that on election day it all comes down to the ground game, local boots on the ground. Delaney proved the theory – again – pumping out the best ammunition for state associations to educate federal and state legislators about sector issues. There is no doubt his fingerprints are all over saving the Johnson Amendment. Getting back to biking and skiing after breaking a hip provides context, a bigger picture. She is all about empowerment for Gates staff, for organizations funded by Gates and for self-help of those who receive the support. Desmond-Hellmann understands sometimes the most important things aren’t measured by a number. If it is possible to be pragmatic and also an innovator then Dreyfus is the complete package. She has worked national and local, which allows her to be a social sector influencer of larger systemic change. As chair of the Leadership 18, she has a hand in the national social service infrastructure, helping to reframe human services. Infogroup and Anne Lewis Strategies have joined forces to lead the charge in digital marketing. Powered by our Apogee digital database, our alignment will provide customized strategy and execution to engage, acquire, and cultivate digital donors. We are uniquely positioned to provide effective strategic solutions to help solve complex digital challenges facing our clients. Firman has developed national programs that improve the health and economic security of older adults. His ideas are tied to collaborative leadership, fostering and scaling evidence-based innovations, social enterprise, and advocacy. His “third act” for older Americans is gaining steam. Firman seeks the power of good ideas. Gallagher ties community action to economic expansion and elevated the idea on stages such as the World Economic Forum, where he leads its Global Civil Society Advisory Board. He evolved UWW into a franchise, providing standardized content and mission backbone to local leaders who customize from there. Gayle’s connections intertwine government, for-profits and the charitable sector at the highest levels. She has the tools to bring Chicago’s leaders to a common goal. She also has a $2.6 billion endowment to help make things happen. More important (almost) than the cash is her ability to communicate and collaborate on some of society’s toughest issues. Forgetting for a second the more than 47,000 people who used the center’s 10 sites during 2017, Gomez has an insatiable hunger for outcomes measures. She’s a pioneer in community based family health. Her medical, social service and educational outcomes measures serve as a local benchmark and national role model. ASAE is Washington, D.C.-centric but Graham took it to the streets to blunt the so-called “bathroom bills” that would damage trade associations, commerce and people in general. His membership has rocketed from 21,000 to 39,000 through innovative offerings in education and tech. He created the next generation of association executives. Greenblatt has always been a social entrepreneur, whether it is launching socially-responsible businesses (Ethos Water), working in government to steer equity policy to pushing technology that scrubs extremists from online platforms. He is working with Starbucks on anti-bias training. He shares resources and is fearless. “We are now living in a deeply challenging time for the cause of justice, fairness, and inclusion,” according to Gupta. It’s unusual for someone so new to a job to make the Top 50. Gupta leads a 200-plus member organization that is hitting everything from the federal budget to voting rights to LBTQ issues to criminal justice. Harold is the consummate deal-maker both behind the scenes and in open forums. He preaches collaboration and through his leadership GuideStar provides important accessible data for transparency. He pushes leaders to take on challenges such as political polarization, its impact on the sector and what they should do about it. Community. Dedication. Vision. Grant Thornton congratulates you. Grant Thornton understands that success is built on more than just talent; it takes passion and perserverance to achieve the vision for a better future. On behalf of the partners and professionals of Grant Thornton’s Not-for-Profit and Higher Education practices, we wholeheartedly commend the 2018 Power & Influence Top 50 honorees for their leadership and impact on the sector. Visit grantthornton.com/nfp for more insights and to sign up to receive thought leadership, alerts and invitations to educational forums. Donor-advised funds have become more controversial in some quarters. The challenge is a flood of money goes in and drips of cash come out. Heisman is making the clearest arguments about why these are going to become a more vital giving tool, particularly in nations where organized philanthropy is a new concept. Herman helps leaders at the largest nonprofits craft policies that ensure all risk elements are considered. It is what managers don’t expect that she is so expert at putting into perspective and planning. She is a human roadshow on the topic. The great thing is she honestly doesn’t get why she is on this list year after year. Horvath’s video logs are some of the most powerful in the charitable space. He pretty much pioneered the use of unfiltered video and storytelling to impact peoples’ lives. His social media presence proves day after day that people react to people not organizations. Jenkins is turning the idea of aging on its ear through her ideas and the muscle of AARP. She often speaks of “disruption.” AARP’s membership is a force that can impact legislation even while being non-partisan, swaying elections. She has spent her life challenging stereotypes and is making those 50 and older more powerful. Johns is one of the best strategic thinkers in the sector. He has navigated the organization through some rough waters, including an insurrection of some of its chapters as the national office worked to standardize programs and priorities. He also makes the best dollars and sense argument for federal funding for discovery. His words: “We’re living through one of the great inflection points of our times.” Hunger is caused by conflict. The route to end conflict is education and establishing economic sustainability. He’s scaling back shipping food and instead paying locals to grow and distribute. It’s a game-changer. You’d think Lynch was in vaudeville given all the towns he’s played (more than 2,000). The roadshow resulted in gains in federal funding despite initially being zeroed out in consecutive years. He coordinated hitting key federal and state legislators in their home districts. The data in the Arts & Economic Prosperity 5 report was persuasive. Madoff has become the go-to person for the counter-point argument when it comes to donor-advised funds. Her ideas are starting to influence lawmakers who see a big pot of unreachable, often stagnant dollars. The tax benefit is instant for money that can sit untouched. Madoff wants the money put to work faster. She’s right. MITCH-STUART, INC. PRESENTS VIP BROADWAY AND BEYOND. Raise funds, excite donors, attract new supporters and add glamour to your fundraising events with Mitch-Stuart’s VIP Broadway experiences. For more information register on our website or call: 1-800-574-9991. Every bit of her education as a board-certified clinical psychologist is being exhausted. She was on top of the resettlement issues before the federal lawsuits on entrance to the U.S. Her social enterprise bent keeps support groups afloat until it all shakes out. She headed to the border when families started being separated. Marsicano refuses to shy away from tough decisions and challenges. He helped fund and coordinate a powerful task force report on generational poverty and launched a project to boost local graduation rates. Marsicano also operated one of the nation’s best recovery programs after Hurricane Matthew. He gets his hands dirty. Moore is a best-selling author, scholar and solider who has known austerity and insists an “America First” policy begins with eradicating poverty. He uses his persuasion and Robin Hood’s checkbook to push leaders to collaborate on public policies, such as public transportation, that can change intergenerational poverty. She makes leadership and inclusion look easy. It isn’t. Because of her keen judgment, Murray-Brown is a “go-to” person for many leaders in the broader nonprofit community, much of it behind the scenes and confidentially. She’s wired-in and universally respected. Nunn can provide the 10,000-foot view but develops it from being on the ground. Rapidly approaching 200,000 miles across more than two dozen countries, she puts her education in faith and social justice to the test each day. She is a convener, collaborator and relationship builder who keeps developing new ways to change the world. It is said that if you don’t fail occasionally you’re not trying often enough. Investors might not be so sure, but Palandjian has tapped into millions of dollars to provide others with access to opportunity. She believes public-private partnership mobilizes capital to drive social progress. Reckford knows that a roof over a family’s head is just the start. He makes the argument about, and connections between, health, education and a community’s center. His ability to bring together proven results in various social service fields builds communities. He is a trusted guru who is sought by other leaders. It’s interesting to watch someone so public work so hard and effectively behind the scenes. He breaks down complex issues and crafts strategies for a worldwide civil society and safety for civic space. He’s a nice guy but with a backbone of steel when using the law to fend off ramifications of the assault on civil society. There are events at which you must be seen and NTEN is one of them the way Sample-Ward has worked to professionalize, or at least corral, the sector’s tech strategizers and implementers. She has created an environment that, as she would say, lessens “the stigma of risks” for new ideas while being transparent. If she wasn’t a nonprofit chief executive Sampson might want to consider professional gambling. As CEO, she keeps rolling 7s. She started a “business” accelerator for nonprofits and got donors to endow her compensation. She changed funding priorities, upsetting many in the community, but turned out to be correct. Smith has become the town crier for risk and research in the foundation world. He pushed the center into the digital age with transparency, developing tools that make the center’s research available to a global audience. He’s keenly aware philanthropy is a network and he’s leading the establishment of those connections. Stasch believes in big ideas and last year paid $145 million via the 100&Change program for four of them, one of which cost $100 million. That’s an example of her trademark of creating urgency. She is now collaborating with other deep pockets on The Audacious Project: Collaborative Philanthropy for Bold Ideas. Rarely does an author prove his point, in this case “New Power,” by using the techniques described to blow the book across nonprofit and for-profit boundaries. Timms has been central to the sector’s most recent important movements, such as #GivingTuesday, the Social Good Summit and an online course with 51,000 students. Tyler had been on the job all of a month when some on Capitol Hill declared that they would repeal the Johnson Amendment by any means possible. She’s a powerful advocate working well for the faith community and with other nonprofits. She’s a rising star in the sector. Vega-Marquis knows grantmaking can’t and shouldn’t always be precisely targeted. Founder of Hispanics in Philanthropy, she has built a network grant model of general support funding to build power in communities of color and low-income populations. She is also taking on immigration reform and DACA. Vredenburgh seized upon the Taylor Swift sexual assault case and translated the issues into what it means for girls -- all before the #MeToo revolution. It is a great example of a nonprofit leader taking a moment in time and bringing it home to those the organization supports. It’s what she has always done, being ahead of the curve. There are many places to find governance material but Wallestad has established BoardSource as the first place to look. Now it’s about standing up for an organization’s mission and training leaders about advocacy and their responsibilities. She is changing nonprofit boardrooms. Sector leaders seek Washington for ideas on deepening community involvement. Ys were always community-minded but inclusiveness was a question. That has changed and his strategies to engage and support LGBTQ individuals and their families in cooperation with the Biden Foundation is just one example.